I could not wait to post this today! First off, I love all three outfits (which one is your favorite??) and secondly, I love this jacket. I am here to make a very strong case for suede in the spring and this jacket is all the evidence I need. I found this lovely jacket the other day on my quick shopping trip where I just grabbed a few favorite things and booked it. (If you’re not a quick shopper before children, you certainly will be after.) This jacket was actually one of the first things I picked up because the rack had 6 colors and I was initially drawn to this lovely lavender hue (of course I was). Once I felt this jacket, I was completely sold. This faux suede jacket is a unicorn — it’s super soft AND lightweight. 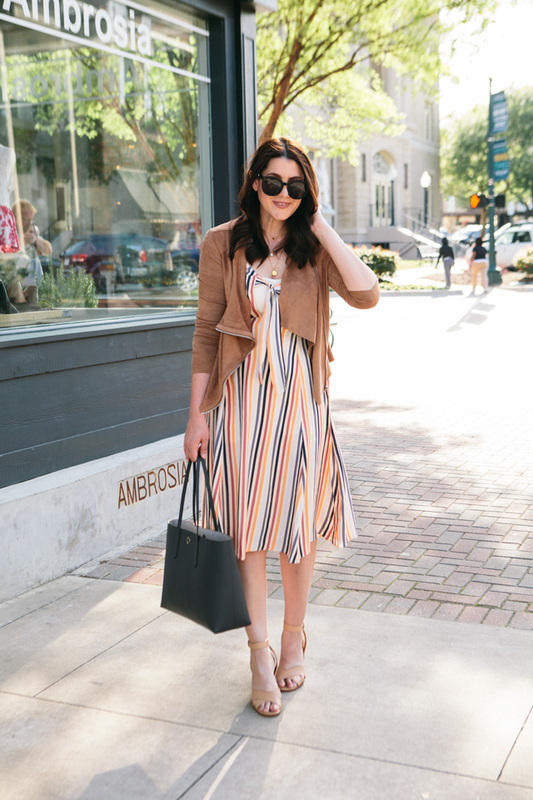 So it’s literally the best jacket for spring. 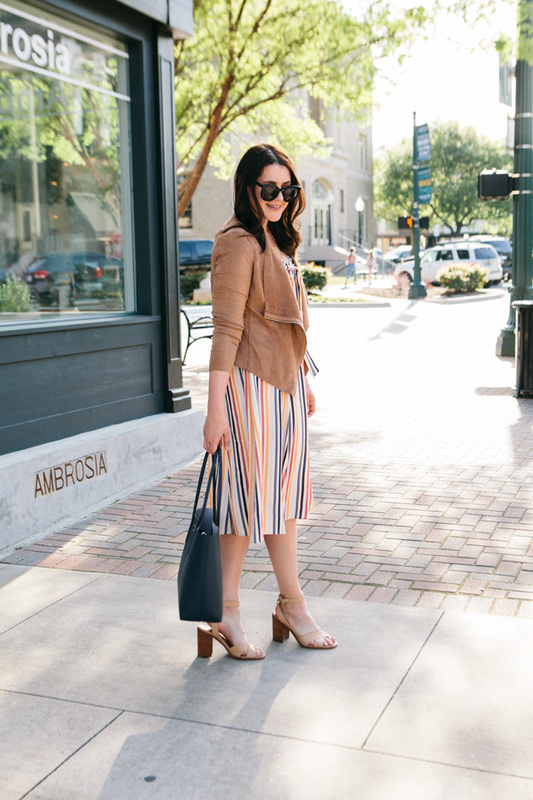 It’s not so heavy that it feels like you’re actually wearing a jacket, but let’s face it — spring still has cold days and layers are always welcome. So I immediately thought this is THE JACKET and I MUST tell everyone I meet about it. I went with this cognac color because it’s the easiest to add into my wardrobe right now but I loved all of the colors. (See them all here!) I am in the medium. I do feel like it fits true to size, but on me, it’s pretty fitted. If you need more arm room, then size up one but I am in my true size! 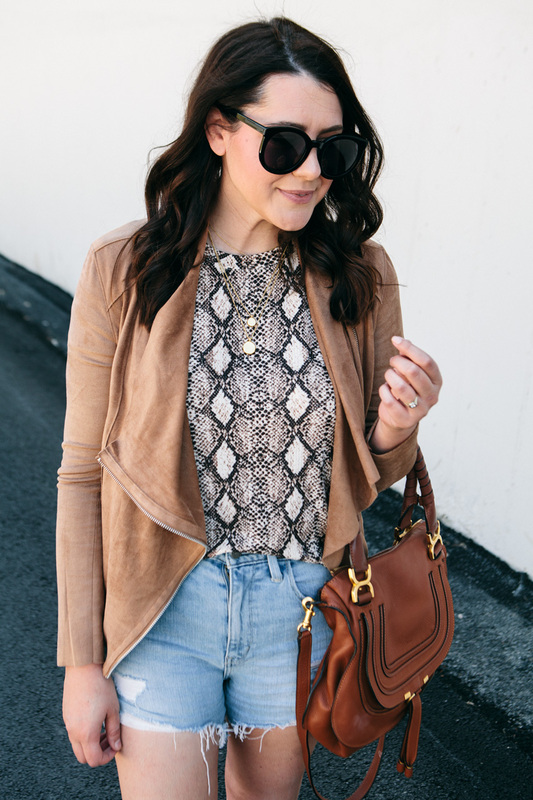 I knew this jacket had a ton of potential, so I thought the best way to show this is a Styled Three Way post! Let’s do it! I knew instantly that this outfit was begging to be worn. 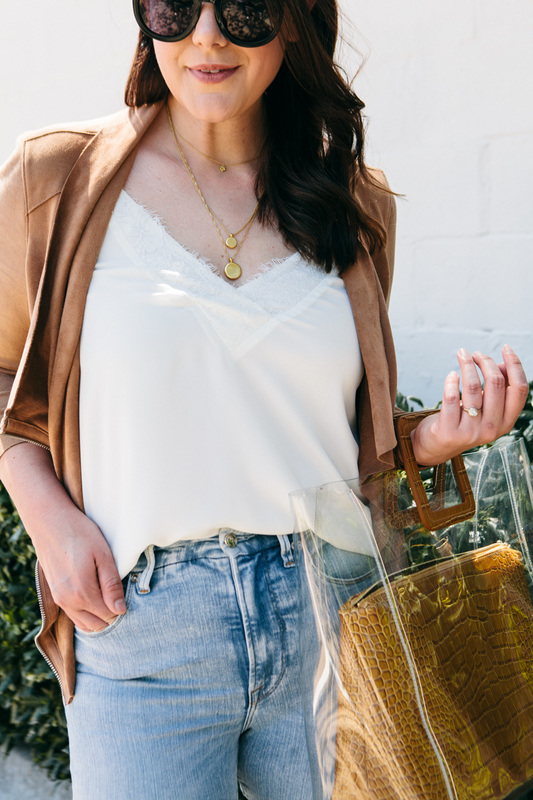 A simple lace camisole (this one is under $30!) and denim create such a timeless look that is equal parts effortless and cool. 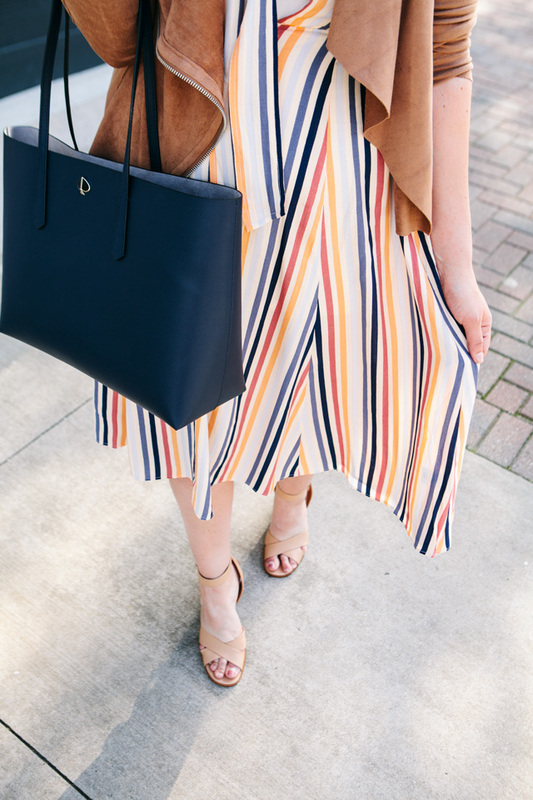 There’s no way to not look chic in this outfit. 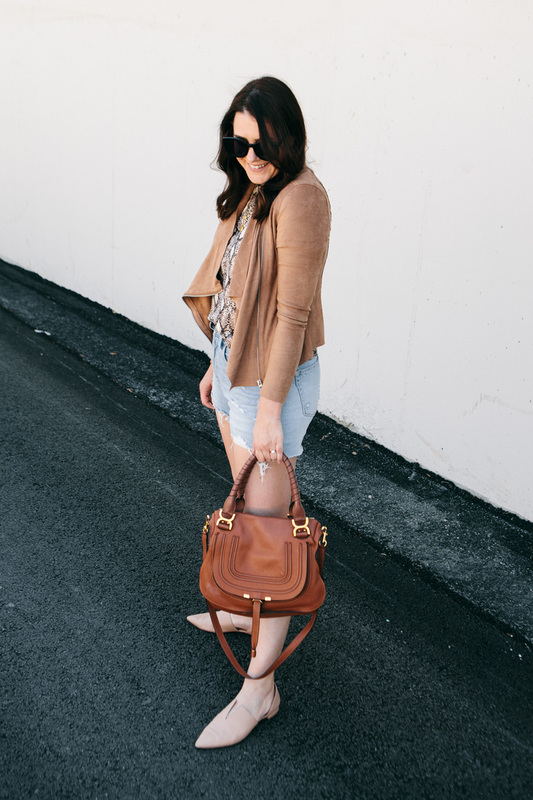 When I added the suede jacket, it was just the icing on top of this classic combo. 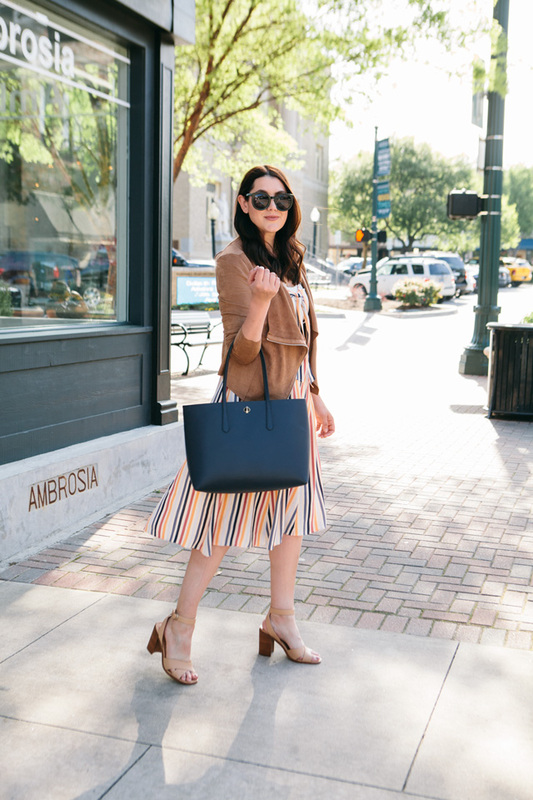 You can find all the elements of this outfit below! I know this post is all about THE JACKET, but I have to give a quick shout out to these jeans. They are Good American, first style I’ve bought from the line, and I LOVE THEM. They didn’t look like they would fit when I got them in but they have amazing stretch and fit like a glove. They are super soft and I love this light color for spring. Don’t be afraid to try this light shade, this spring! It’s actually easy to pair and wear 🙂 You can find them here. 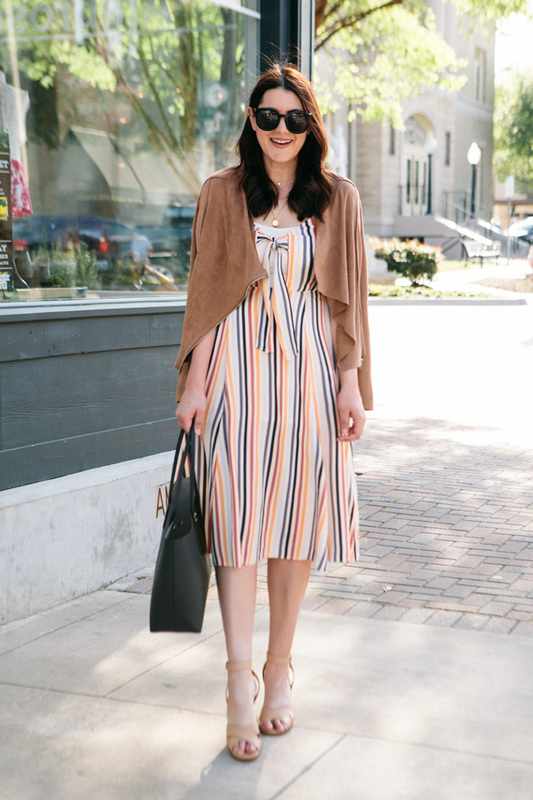 I also picked up this midi dress because if you’ve not realized this lately, I’ve very into the rainbow. 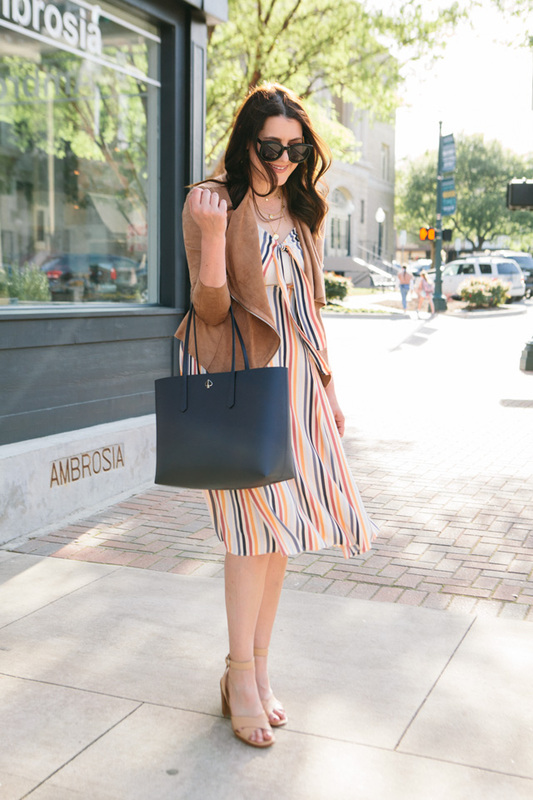 I think that this dress is a subtle nod to the rainbow trend and I loved the shape of this dress. (I have a fuller bust so I am wearing this slip camisole underneath for more coverage in the chest area. It wasn’t that noticeable, which was nice. If you are less blessed in the chest, this dress would be a perfect fit! If you are blessed, a camisole and a normal bra work!) 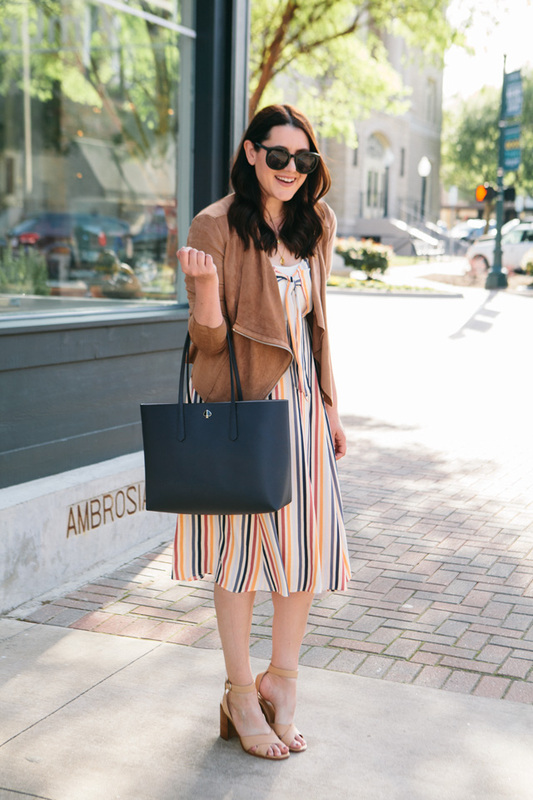 I was THRILLED to see my new favorite jacket worked so well with this dress since I still need some coverage on my arms. We aren’t quite to sleeveless weather yet. I love how the jacket upgrades the dress to daytime status because this dress could quickly go into casual territory. You can find all the elements of this outfit below! What do you think? Loving the jacket with the dress, like I am? Could I have three more different looks with this jacket? I really feel like this jacket works for all styles! This outfit came together quite naturally as I was running out the door the other day and had this snakeskin tee and shorts (similar here!) on and just grabbed my jacket on the way out. Bryan looked at me confused and said ‘are we shooting this?’ which usually means he thinks I look cute. 😉 I quickly looked in the mirror and said YES WE ARE! And there you have it, my third outfit came to be. I’m telling you, this jacket is like how you feel about your cardigans — you don’t want to leave home without it. As far as this snakeskin tee, we are loving it, yes? I sized up because that brand tends to run a bit small for me. You can find the tee here and all the elements of my outfit are below! 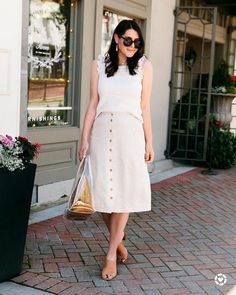 I loved how easily this outfit came together and I also love that this outfit can transition into late summer as well. That weird time when we are ready for fall but the temperatures just aren’t there yet. 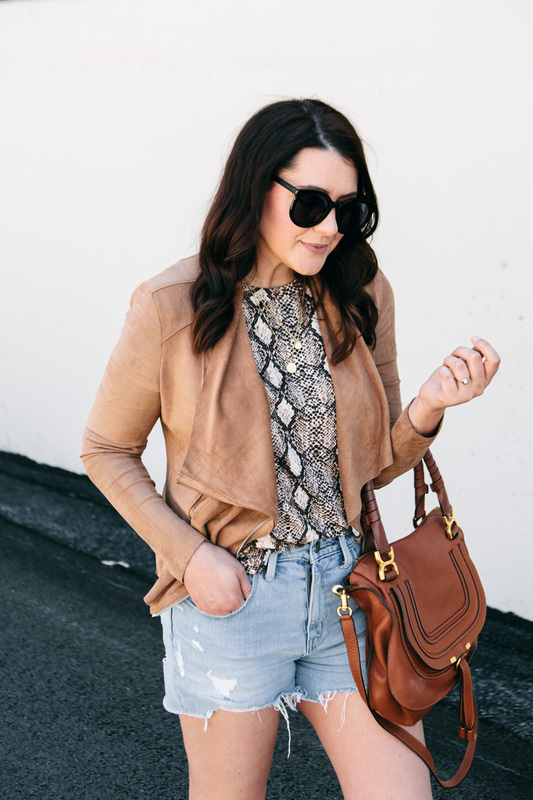 This jacket is perfect for that transition back into cooler weather, just as it is for the transition out of the cold. I’m telling you, this jacket is a real team player. You can find this jacket here! So…which outfit is your favorite? I can’t decide because I’m always partial to what I wear. 😉 Let me know in the comments below! 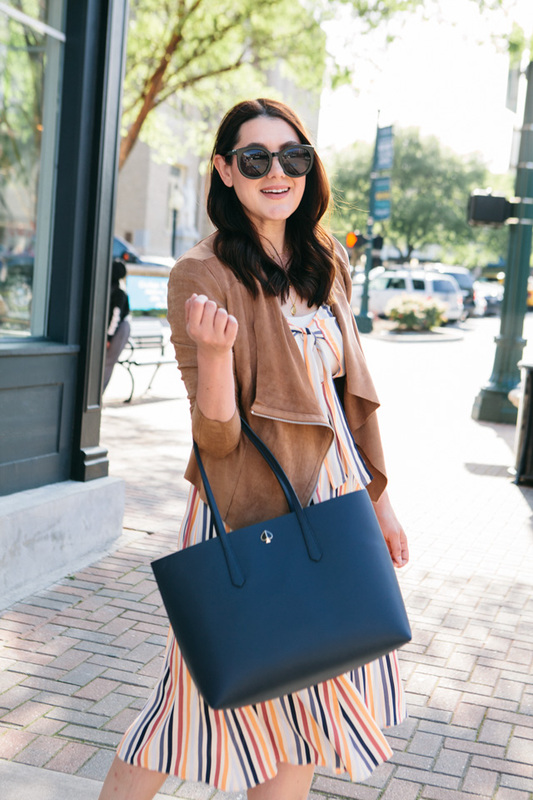 Special thank you to Nordstrom for partnering on this post! And thank YOU for supporting the brands that continue to support this blog! Jacket: size medium! Fit is true to size, size up if you want a looser fit. Camisole: size large. I sized up for my chest. If not above a D-cup, stay TTS. Snakeskin tee: size large. I sized up for length, glad I did! Jeans: I stayed TTS. I am in the 29. Dress: size medium. Fit is true to size, but you will need a camisole if you have C-D cup. Shorts: true to size! I am in the 29. 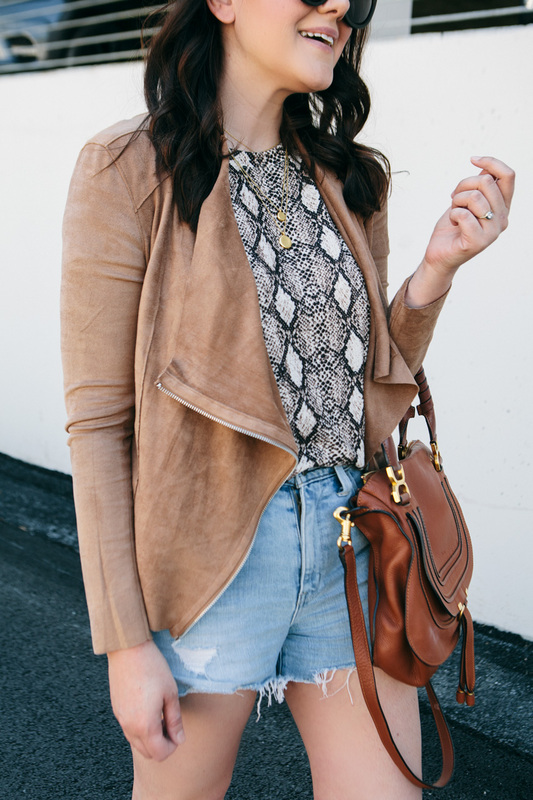 You definitely nailed styling this suede jacket! All outfits are amazing! This jackets is really good for women. Leather jackets is so popular in every generation.